Where do canines go on their holidays? To the Hound Hotel, of course! In this silly title from veteran slot creators Microgaming, we’re on vacation with a load of doggies at a particularly busy time of year it seems! The game makes use of tasteful artwork to complement its not-so-serious theme and has a load of interesting special features to boot. This combination gives it a load of replay value. Let’s look closer at what Hound Hotel has to offer! Great quirky theme that is complemented by the artwork. There’s a real feel of that classic “dogs playing poker” painting going on! Loads of great bonus features that give the action tremendous replay value. Low main game prizes. They’re not the worst around but when some games let you spin in an instant win of five figures, they do seem overly small. Lack of options to adjust bet distribution. Chihuahua “Scatter” Symbol = 100x the total bet. Hound Hotel “Wild” = 20xthe total bet. Red St Bernard = 18x the total bet. Yellow Huskie = 16x the total bet. Pink Poodle = 12x the total bet. Green Scottie = 8x the total bet. Blue Pug = 6x the total bet. 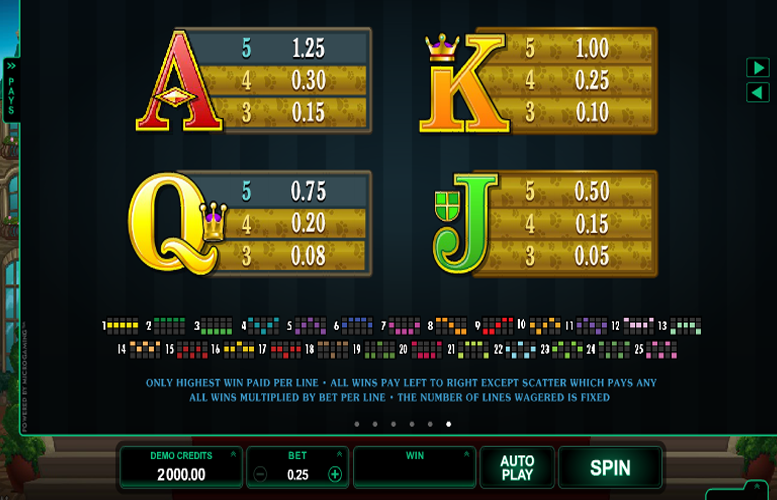 The slot advertises a biggest possible win of 110,000 coins. Three Dashing “wild” symbols can be added randomly in different positions on any non-winning spin. They substitute for all symbols except the “Scatter”. The Hound Hotel “Wild” symbol can appear stacked in threes on the reels. It too substitutes for all symbols except the “Scatter”. If players land three, four, or five “Scatter” symbols in any position, they will trigger the Hound Hotel Bonus feature. 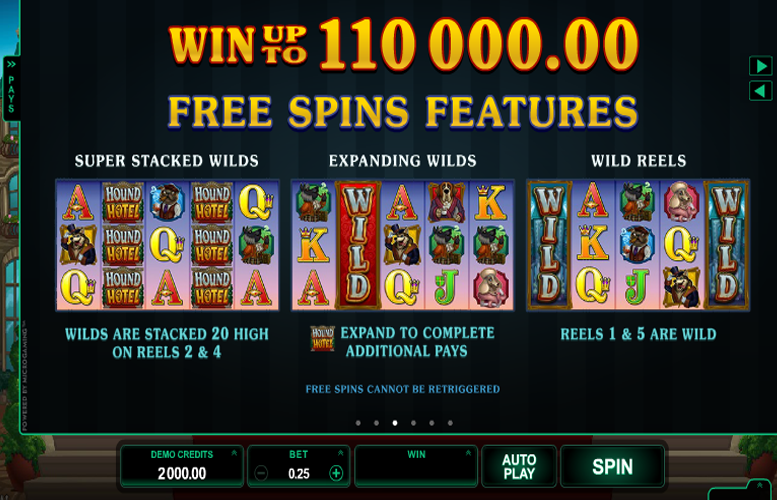 In this mode, they can win one of five “Wild” Free Spins Features. Players are presented with three of the hotel floors. They must pick a door on each to reveal the bonus features they will play with. On floor one, they choose which special “wild” feature is played. On floor two, they choose the size of the multiplier they will play with. 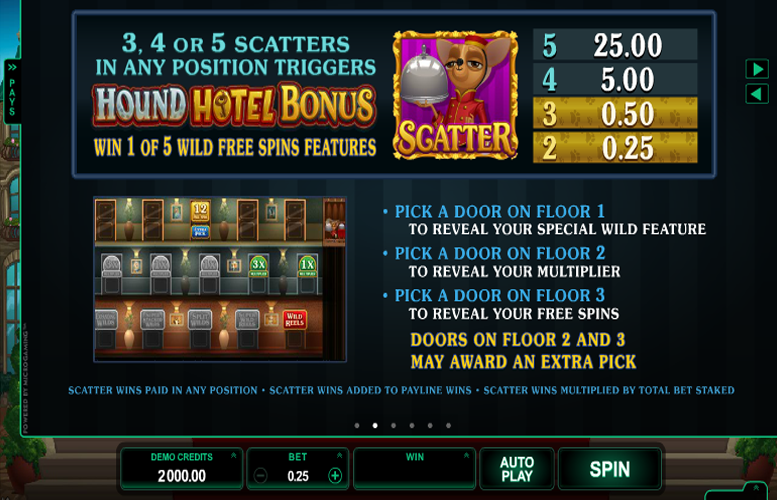 Finally, on floor three, they choose a door to reveal the number of free spins they will play. In addition, the doors on floor two and three can also award an extra selection. Super-stacked “Wilds” = “Wild” symbols are stacked in 20 symbol high towers on reels two and four. Expanding “Wilds” = Game logo symbol will expand to complete any additional payments possible. “Wild” Reels = The entire first and last reels are “Wild”. Split “Wilds” = Game logo symbol can split in two to create additional winning combinations. This can result in an impressive six-of-a-kind win which awards twice the prize of the equivalent five-of-a-kind combination. Super “Wild” Reels = Up to three of the reels will turn “Wild”, depending on the position of the “Scatters”. A “Scatter” on reel one or five will turn that reel “Wild”. Meanwhile, a “Scatter” on reels one and five will turn both reels “Wild”. The middle reel is “Wild” by default during this mode. Queen = 3x the total bet. Jack = 2x the total bet. 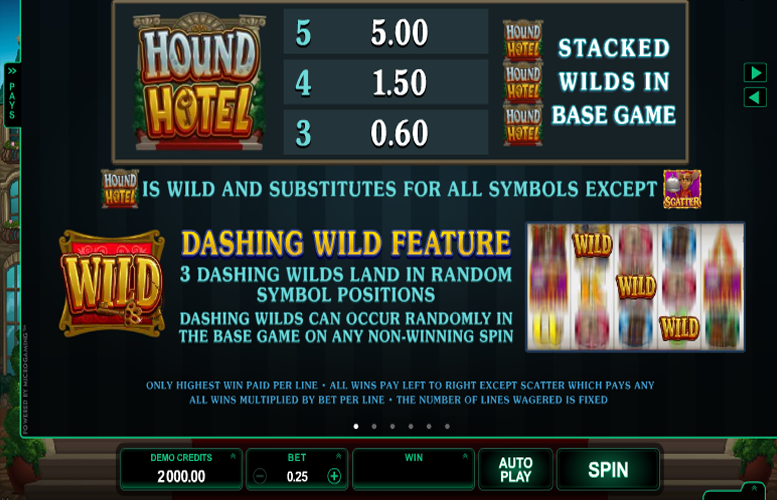 Like with many Microgaming slot machines, players are limited when it comes to distributing their bets on the Hound Hotel slot machine. With the number of win lines fixed at 25 and no way of adjusting how much is bet on each, they can only alter the total bet. These range in increments between 25p and £75. Whilst this upper betting limit will no doubt satisfy most gamblers out there, some of the highest rollers might find it overly limiting. 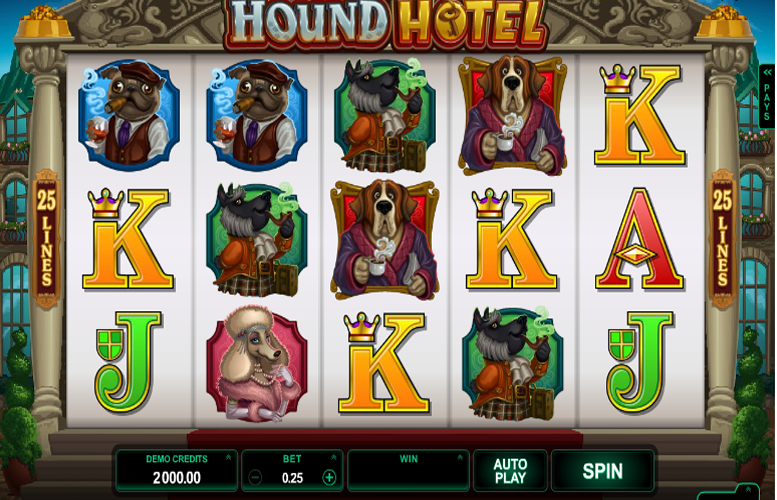 The Hound Hotel slot machine is a great title for this who like a game that doesn’t take itself too seriously. It uses amusingly illustrated symbols depicting the canine guests which give the action a real character unlike many other games. On top of this, there are loads of great special features which really keep the game exciting. 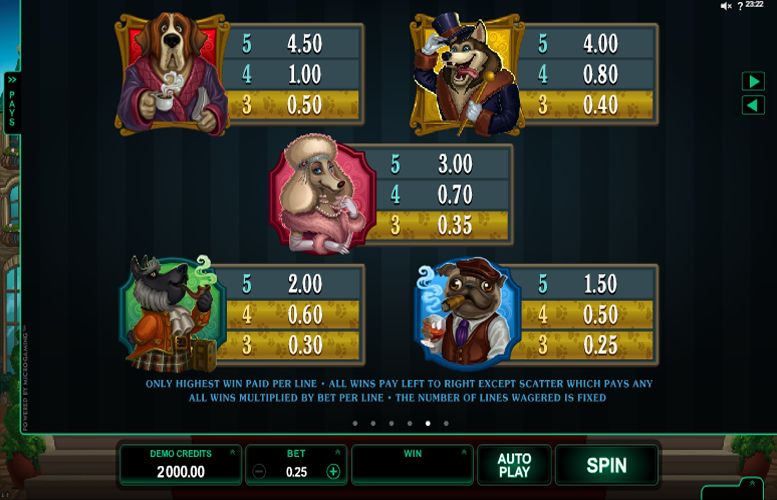 If you like dogs, high RTP machines, or just slot machines with dafter themes, this one might be right up your street!